A friend at the office shared this insanely simple soup with me, and I haven’t stopped making it since. With only 5 ingredients and 20 minutes of cooking time, it’s a go-to meal at my house. You will not believe how the salsa verde provides layers and layers of flavor. I don’t even add salt! Great for groups, a fast supper, or to make ahead and take for lunch. Heat chicken stock in a large Dutch oven over medium-high heat. Add shredded chicken, beans, salsa verde, and cumin. Bring to a boil, then cover and reduce heat to medium-low. Simmer for 15-30 minutes. Just before serving, add copious amounts of chopped cilantro, green onions, and avocado. 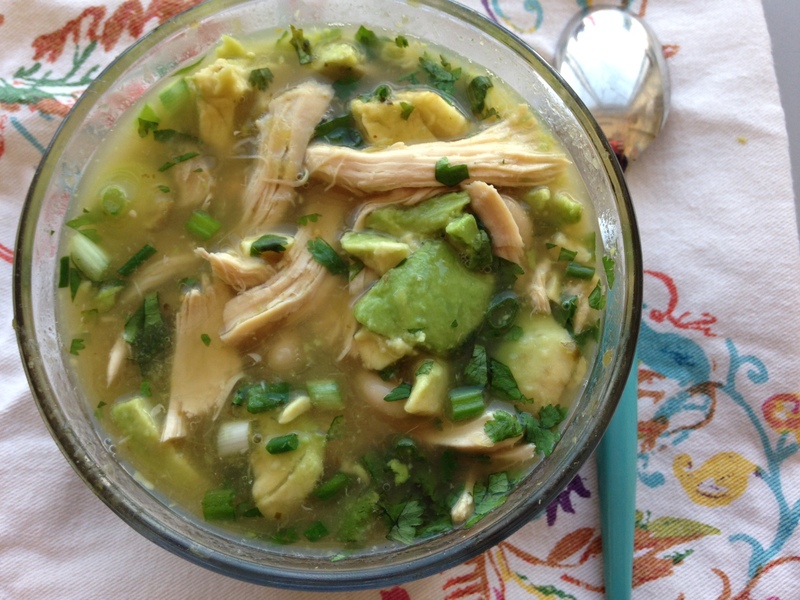 Categories: Recipes, Uncategorized | Tags: avocado, salsa verde, soup, white chicken chili | Permalink. My new goal in life is lunch. Well, taking my lunch to work, more specifically. There are a few roadblocks to this situation. 1. I get bored. 2. It needs protein. 3. It’s also great if Nate will eat it. 4. It can’t be complicated. The past few weeks I’ve been making something easy on Sunday night that I can take throughout the week. And it’s working! Inspired by a menu item at FirstWatch, this salad has become a lunchtime staple. It’s great served warm, cold, or room temperature too. In a rice cooker (or device of your choice), cook the quinoa in the chicken stock (or water). Toss the diced zucchini with olive oil, salt, and pepper. Roast in oven until golden brown. When quinoa is cooked, pour into a large bowl and allow to cool a few minutes. Meanwhile, remove breasts from rotisserie chicken and cut into large bite-sized pieces. Add cooked zucchini, dried cherries, chicken, parsley, and almonds to quinoa. Stir to combine. Gently stir in goat cheese. Add dressing and stir to coat. Taste for seasoning. Add more dressing if desired. 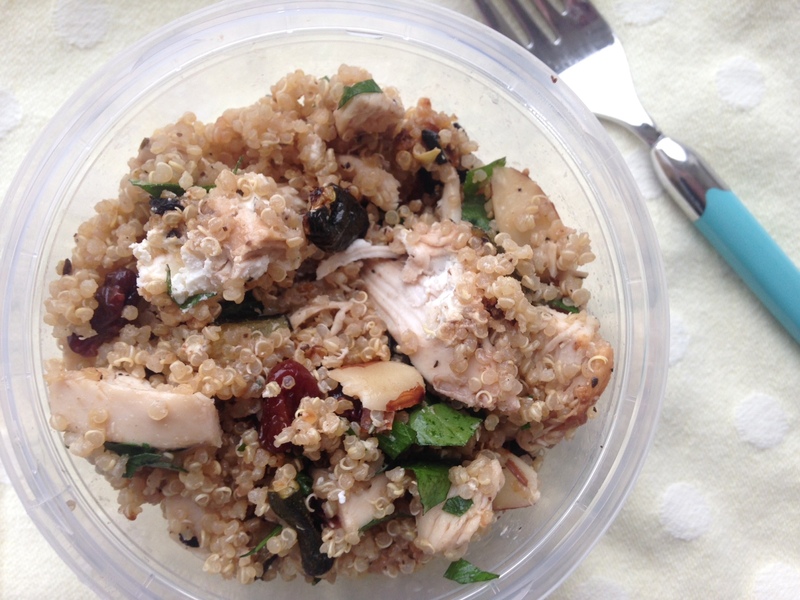 Categories: Recipes, Uncategorized | Tags: cherry, chicken, chicken cherry quinoa salad, quinoa | Permalink. Sometimes I have trouble with breakfast. Between hitting snooze, corralling dogs, gathering gym clothes, and the rest of the morning routine, I can’t always find time for the most important meal of the day. And sadly, that usually ends in a dry, chewy protein bar. But since discovering overnight oats, my mornings are much happier! This protein-packed, make-ahead breakfast is so easy and filling. There are lots of different ways you can dress up overnight oats, but this is my favorite so far. In a bowl, combine all ingredients and mix well. Divide between three 1-cup bowls or mason jars. Cover and refrigerate overnight. The oats will soften and absorb the liquid. Enjoy as is, add toppings such as nuts, or heat and serve warm. 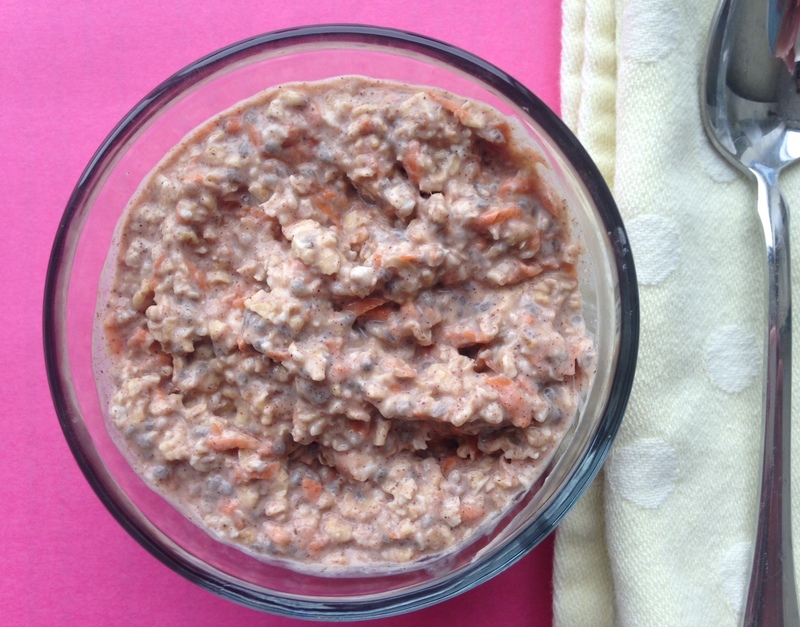 Categories: Recipes, Uncategorized | Tags: breakfast, carrot, fall, overnight oats | Permalink. 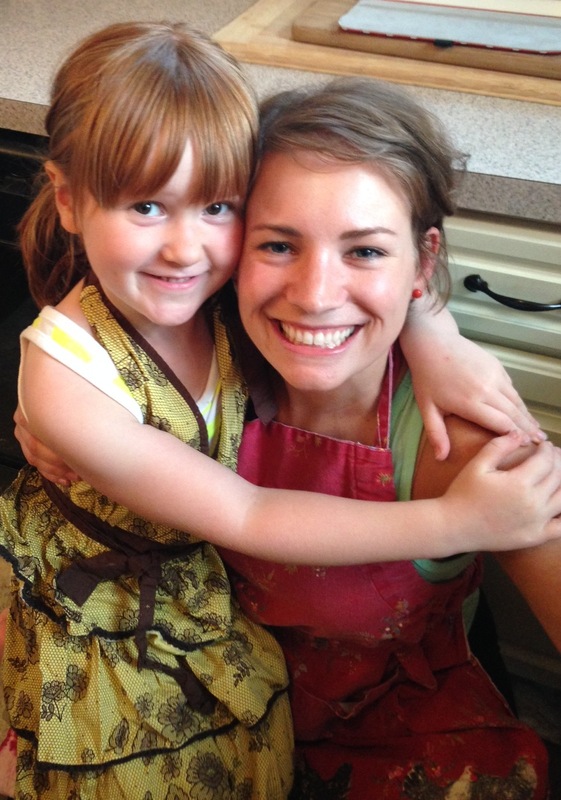 If it were up to my main squeeze, there would be a lot more pasta cooked in our house. Don’t get me wrong; pasta is one of my favorite things to eat. Cream sauce, red sauce, pesto. I’m all in. But I try not to overdo it. Everything in moderation. Including moderation. Right? This shrimp pasta dish has become a quick go-to at our house, and I usually have all the ingredients at home. Due to our sad landlocked state, I keep bags of frozen shrimp in the freezer for fast meals like this. And you can skip the broccoli altogether if you want. See? Easy. If using frozen shrimp, quickly rinse under cold water to thaw. Set aside. Sprinkle broccoli with olive oil, salt, and pepper. Toss to coat. Spread in one layer on a baking sheet and place in the oven. Next melt the butter in an oven-safe sauté pan over low heat. Add the olive oil, garlic, rosemary, red pepper flakes, ½ teaspoon salt, and ¼ teaspoon pepper. Cook one to two minutes. Remove the pan from the heat and zest the lemon into the sauce. Toss in the shrimp and spread into one layer (overlapping is fine). Slice half of the lemon into thin rounds, and tuck those rounds into the shrimp. Sprinkle with ½ teaspoon coarse salt and ¼ teaspoon fresh ground pepper. Place sauté pan in hot oven. Check on the broccoli and toss. Roast the shrimp for 12 to 15 minutes until they are firm and pink. Do not overcook! Meanwhile, bring a pot of water to boil and cook pasta according to package directions. All elements—pasta, shrimp, and broccoli—should finish cooking around the same time. Drain the pasta and pour it directly into the shrimp. Toss to coat the noodles in the buttery sauce. Squeeze the other half of the lemon juice over the pasta. Add the broccoli and toss again. Serve in large pasta bowls. Sprinkle with Parmesan cheese if you’re into that sort of thing. 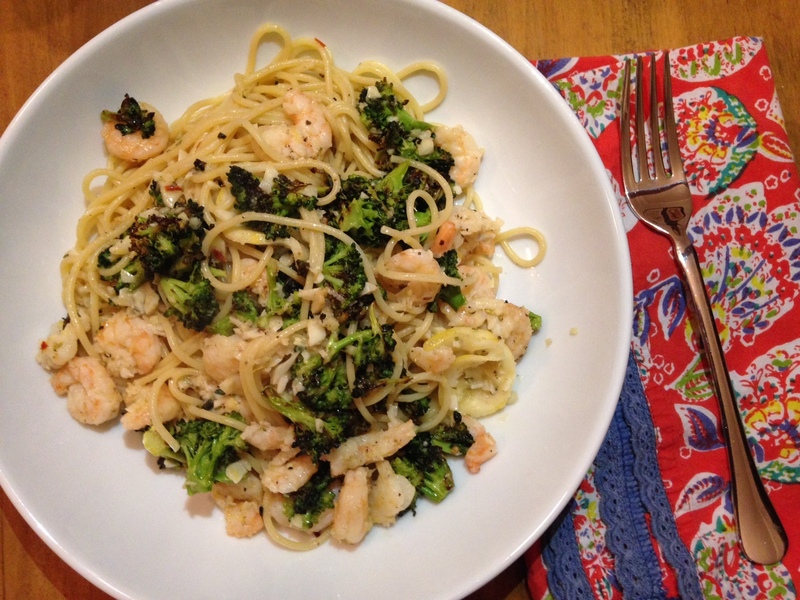 Categories: Recipes | Tags: broccoli, garlic, pasta, shrimp | Permalink. A snow day seems like a good time to come out of blogging hibernation. This gap has been filled with getting engaged and making plans and tying the knot and honeymooning and newly-wedding and blessing upon blessing upon blessing. I am so thankful! This recipe contains a lot of cans and a little time. The hardest thing you have to do is chop an onion. Though that can be a feat with all the tears and runny mascara. At least that’s what it looks like for me sometimes. So, this soup is not exactly fine dining. But it is warm and super delicious with loads of yummy toppings. Um, yes, I totally just called Fritos an accoutrement. Brown the ground beef, onion, and garlic in a Dutch oven. Drain any excess grease. Add remaining ingredients and bring to a boil. Reduce heat, cover, and simmer on medium-low for an hour. Stir occasionally, checking the level of liquid. If too thick, add more stock. If too thin, remove lid while simmering. Serve hot will desired toppings. I recommend all of them. 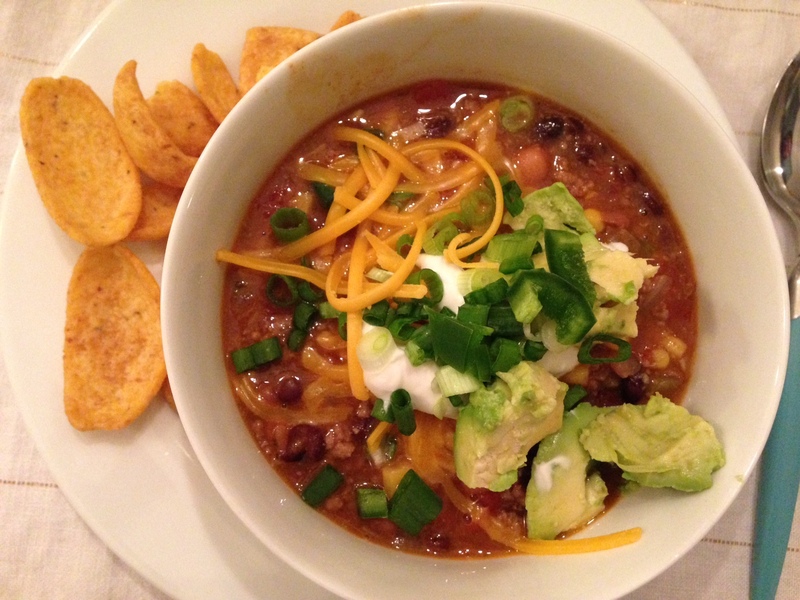 Categories: Recipes | Tags: taco soup | Permalink. 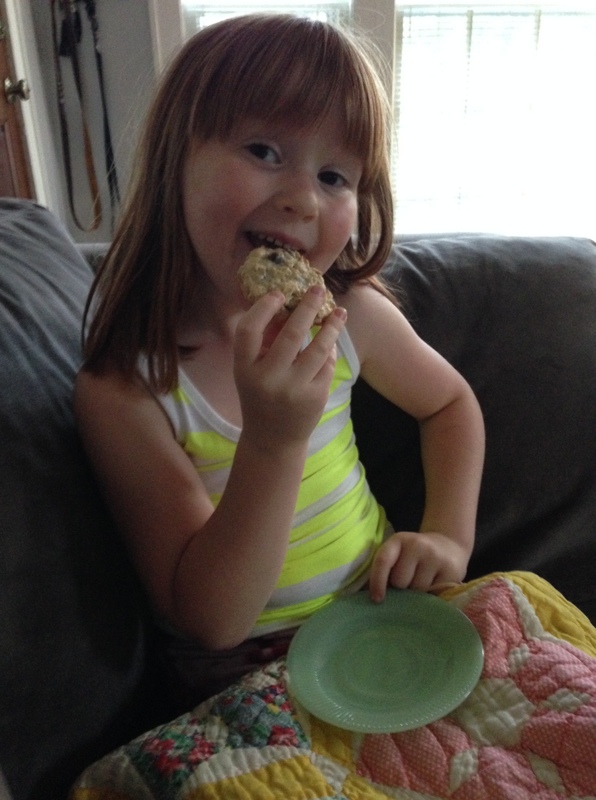 My favorite 5-year-old neighbor came over to make cookies last night. 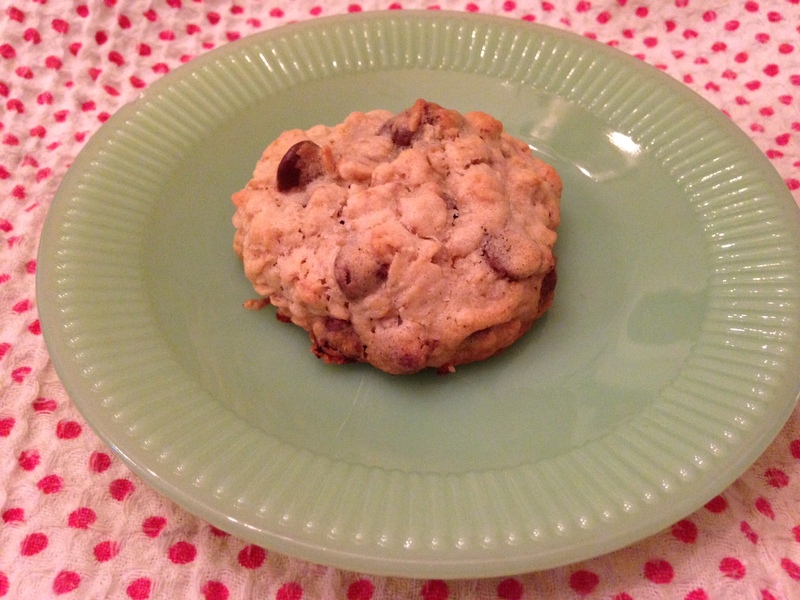 And, bonus, she wanted to make my favorite kind—oatmeal chocolate chip without nuts! I’d never made these before, but this simple recipe turned out just right. The cookies were thick and chewy in the middle but golden and crisp on the edges. Yum. Whisk the flour, baking powder, and salt in a small bowl; set aside. Using a mixer, cream together the butter and sugars on medium speed until light and fluffy. Beat in the eggs and then the vanilla. Stir in the flour mixture with a wooden spoon or a spatula, then stir in the oats and chocolate chips. Using 2 tablespoons per cookie, roll the dough into balls and evenly space them on the cookie sheet. Bake until the cookie edges are just golden brown, but the middles are still pale, about 13 to 15 minutes, rotating the sheet from front to back halfway through the baking time. Cool the cookies on the baking sheet for 2 minutes, then transfer to a cooling rack to cool. Stored in an airtight container at room temperature. We had a blast! After the cookies came out of the oven, we ate them while we watched Brave. And we already have a plan for our next baking night—brownies. 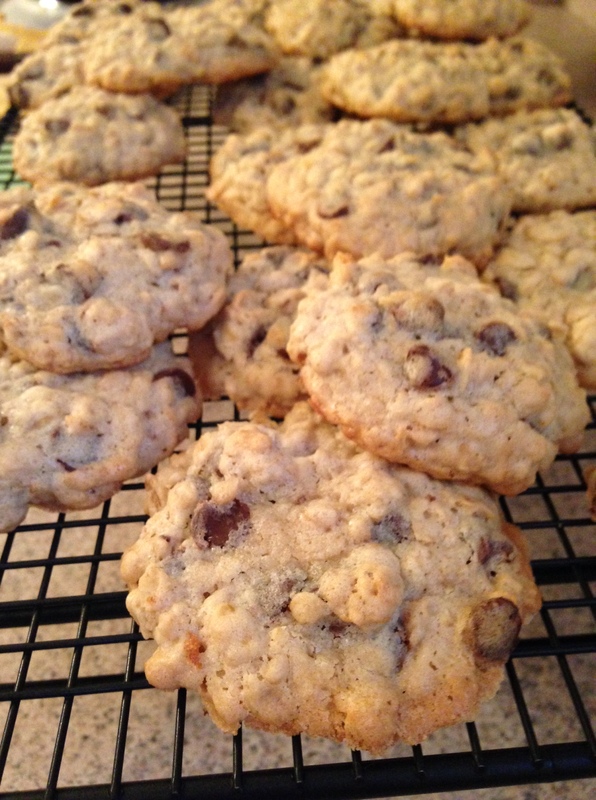 Categories: Uncategorized | Tags: aza, oatmeal chocolate chip cookies | Permalink. Summer produce is my favorite. Everything is juicier, sweeter, fresher, and cheaper. When pints of blueberries were on sale for less than $2, I decided to try making homemade jam. 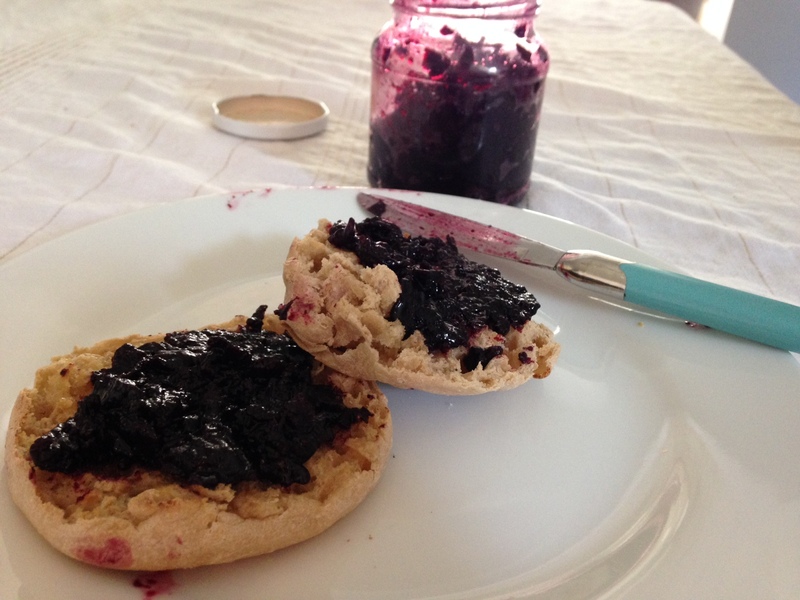 Jam is one of those things I’ve always wanted to make myself, but the task seemed daunting. I have canned strawberry jam with my mom in the past, and canning is such a process. But if you just want to make a couple of use-it-now jars, you should! Turns out, making your own jam is like making your own salad dressing—it’s so easy, why wouldn’t you do it yourself? I am a big fan of using lavender in my food, but if you’re not, that’s OK. Just leave it out. Your jam will still turn out thick and scrumptious. 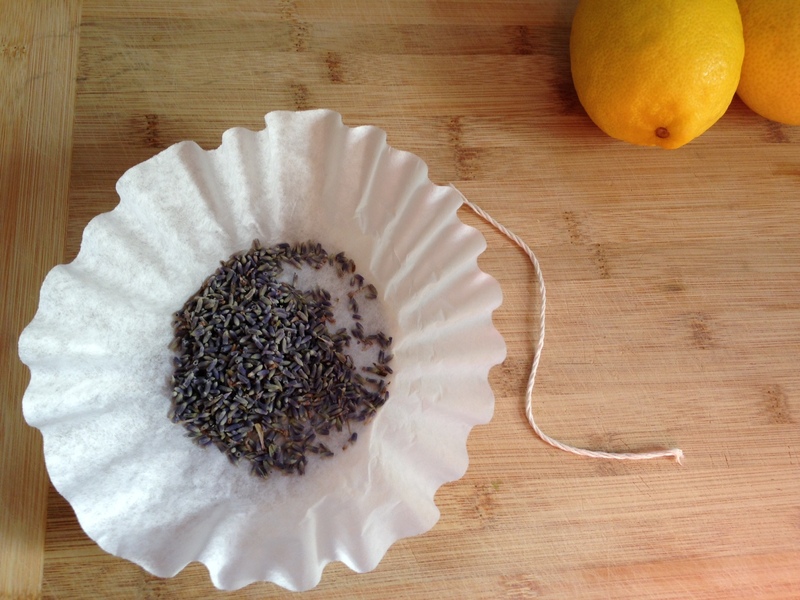 Make a lavender sachet using cheesecloth or a coffee filter. 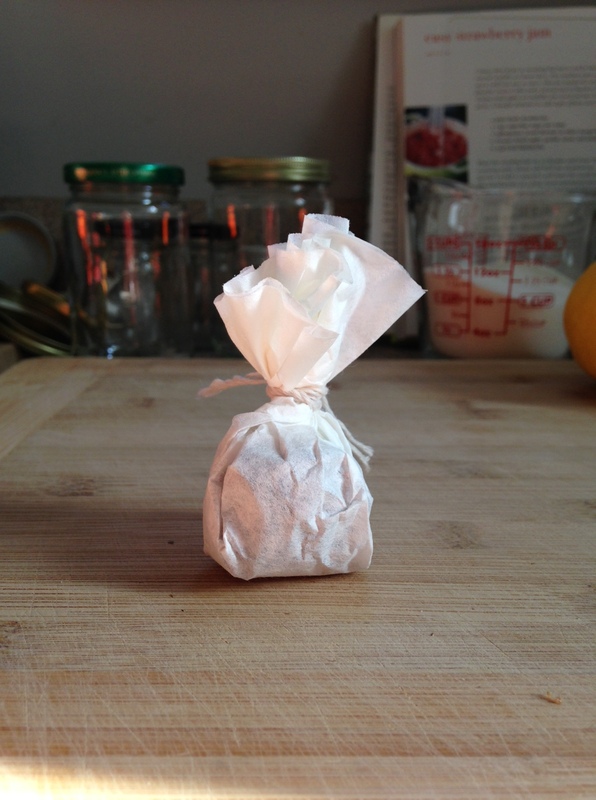 Simply place lavender inside and tie with string. 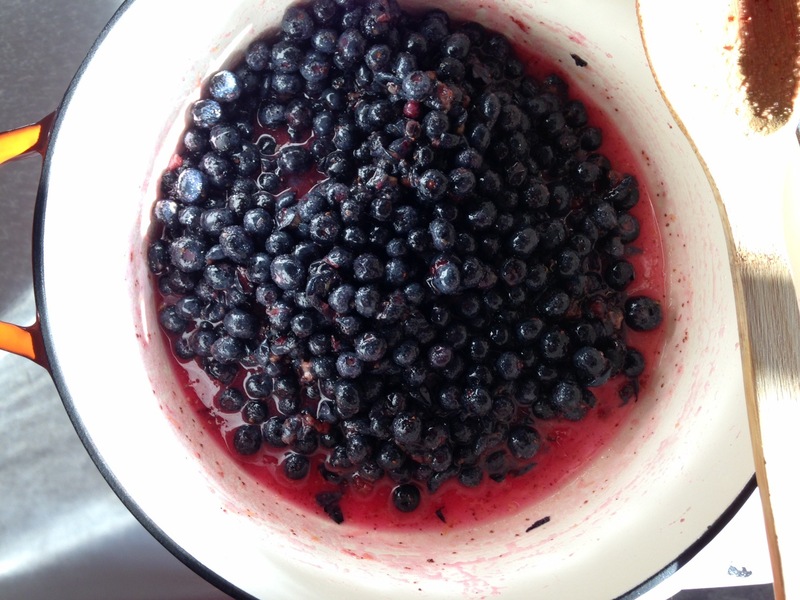 Add blueberries, lemon zest, lemon juice, and sugar to a heavy pot over medium-high heat. Stir to combine. P.S. 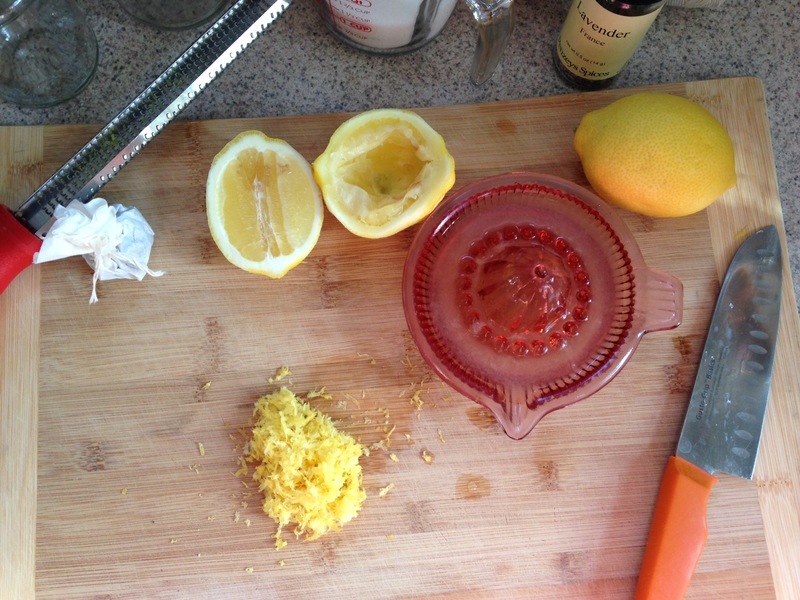 Did you know that you get more juice out of a lemon by cutting it length-wise? True story. Toss in the lavender sachet, and bring to a boil, stirring often. Continue cooking for 25 to 35 minutes or until the mixture jells. Test for jell consistency by cooling a small amount on a plate and touching it with your fingers. Remove and discard the sachet. Pour jam into jars and cool to room temperature. Store in the fridge & enjoy on muffins, toast, pancakes, and biscuits. 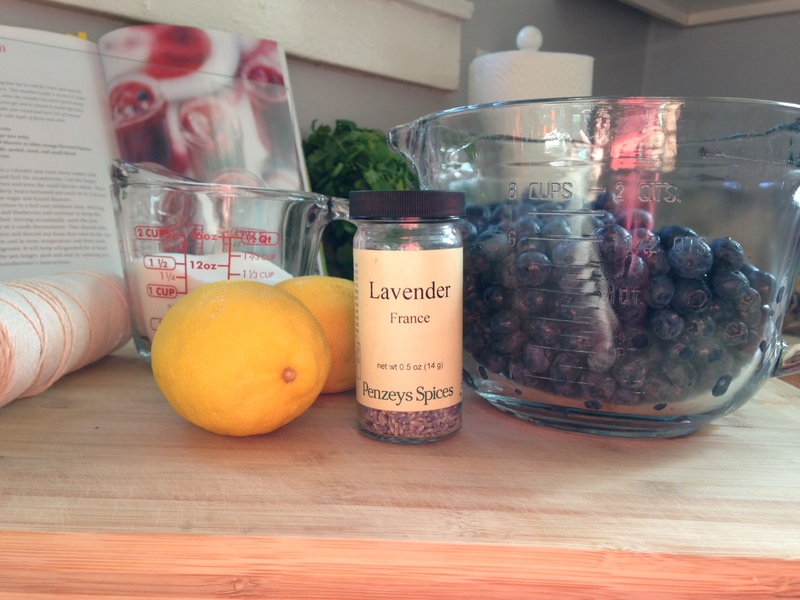 Categories: Recipes | Tags: blueberries, blueberry lavender jam, jam, lavender | Permalink.